What the heck is Chuvash? For those who don’t know yet: Chuvash are people who live in Chuvash Republic in Russian Federation, and abroad, as me. We are 1.5 million. Chuvash is also a language, an official language of the Republic, a minority language, that is completely different from the second official language Russian. Chuvash uses Cyrillic letters, all 33 Russian letters plus 4 additional letters: A breve (Ӑ), E breve (Ӗ), C cedilla (Ҫ) and U with double acute (Ӳ). There is no official Chuvash keyboard layout. What we have is a de facto standard – a very humble layout. It is “humble” because it does not dare to put Chuvash letters on the buttons directly, they are accessible through modifiers: AltGr in Windows and Linux, Option on a Mac. To get A breve you press AltGr and A in the same time. That is not a good input method for Chuvash where additional letters with diacritics (breve, double acute and cedilla) are more common than some Russian letters. In fact, many Russian letters are just part of the Chuvash alphabet because the loan words are just imported in the original spelling. The reason why this humble keyboard layout was introduced and became a de facto standard was a will to provide a fully functional Russian keyboard layout with a bonus – being able to write in Chuvash, although a hard way. It is hard to write, but it is very simple to have (you don’t need to switch input sources), it is easy to explain: want a diacritic, just press AltGr and the corresponding plain letter. I created the same layout for Mac, too. In future a better, more Chuvash, keyboard layout must be designed and agreed upon. AFAIK, there is no keyboard layout (“input source”) for any minority language in Russia. On the other hand the process of creating and installing a custom keyboard layout is easiest on a Mac. I followed the steps described on Salvatore Testa’s blog: I installed Ukulele and created a new keyboard layout based on Russian PC. That bundle that is saved from Ukulele needs to be copied to ~/Library/Keyboard Layouts/ folder. Then (presumably after a computer restart), Chuvash can be added as an input source. Custom keyboard layouts are just files (bundles) in a user’s home folder. No need for Administrator rights (as in Windows for installing a custom keyboard layout as an exe file), no sudo access to X11 folder (as in Linux). What I would like to wish is the presence of Chuvash and other minority languages’ keyboard layouts directly Out-of-the-Box on Mac OS, iOS, Android and Windows. 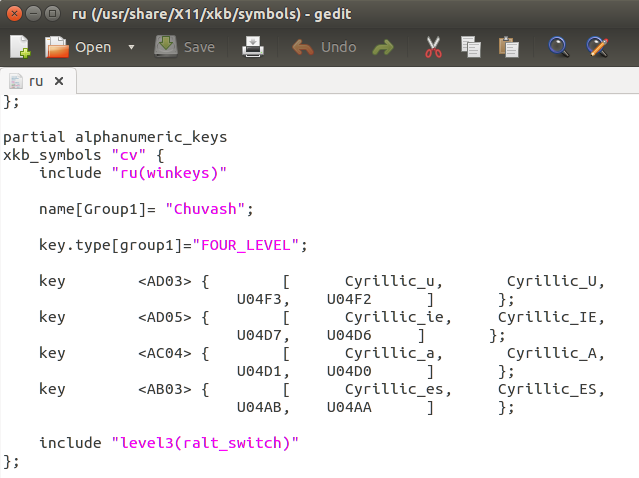 Linux is the only OS family that natively supports Chuvash keyboard layout. I want this text to be searchable and findable, so here come summary of this blog post in Chuvash and Russian. Чӑваш сарӑмӗ Линукс, Виндовс, татат Андроид оператив системисенче пуррине халӑх пӗлет-ҫкӗ. Паян эпӗ Маккинтош (Mac OS) валли чӑваш сарӑмне турӑм. Вӑл виндовсри тата линуксри пекех, мӑйракаллисене ҫырас тесен Option (Alt) пускӑчне пусса мӑйракасӑррине пӗрле пусмалла. Option + А – Ӑ пулать. Ку ҫӗнни мар. Сарӑмӗ тата мӗнле лартмалли ку вырӑнта тупӑнать (хальлӗх акӑлчанла, анчах вӗҫ ӑнлантарнине ӳкерчӗклентертӗм). Теперь есть чувашская раскладка для Mac OS, она такая же как и на Виндовс и Линукс. Чтобы написать Ӑ нужно нажать на Option (Alt) и на букву А. Раскладку и инструкцию по установке можно найти на этой странице (инструкция на английском пока, но все шаги проиллюстрированы картинками). I won’t go into details about how to work with Ukulele. But I was very surprised how easy it was to update the keyboard layout. And more surprised I became when I saw that Chuvash was present in the list of available languages. Just to compare, Chuvash exists as a language in many systems in the Open Source world and close to it: Linux, Firefox, Wikipedia… For Microsoft Chuvash does not exist. No LCID, no locale, no way of referencing cv and cv-RU. There is one exception – Skype, but it was added before Skype was bought by Microsoft. I really hope it can be changed in future. The last step was to rename to Chuvash – PC and generate an ID within the range for Cyrillic keyboards. After I installed my Chuvash keyboard layout and I was glad, suddenly I could not open Word, it just crashed. I didn’t realize that it was due my custom keyboard layout. How painful, that Microsoft products crash on a custom keyboard layout. Sigh. It is easy to communicate about how the right Alt button works. The Right-Alt-technique is also used in Esperanto, Polish and other languages. We are working on a Chuvash keyboard for iOS. There we have less place and we have to remove rare Russian letters from the first keyboard screen. There are no physical labels. So we can rethink the whole keyboard. I’ll write a separate post about the Chuvash Keyboard for iOS. One of the important things we made during that work was to find the frequency of the Chuvash letters. This was used to design the keyboard layout. The most used letters are in the middle. Consonants and vocals come after each other. We tried to avoid many consonants after each other. When it is possible on a virtual keyboard, wouldn’t it be worth trying on a physical keyboard? Knowing the “best” layout, we can implement it for a physical keyboard. Let’s do it for xkb. xkb is a keyboard system for Linux. I wrote a few articles on that topic. And access to Russian letters, because they are part of the official Tatar alphabet, but they are only used in Russian loanwords. The placement of those rare Russian letters are the same as in the Russian layout (except that they are accessible by pressing the Right-Alt button). When I use it, I always press the Right-Alt, because the ӑӗҫӳ in Chuvash are very common. So the Right-Alt is not an exception, rather that a regular typing behaviour. Some Chuvash frequently used Chuvash letters (х, й, э) are placed too from the middle. Some rare letters (ф, ц, ж, о, г, щ) are too “near”. and, perhaps, less Russian loanwords caused by laziness. To create a custom keyboard layout for Windows is easy, but it is hard to contribute to Windows official releases. We only need to install the Microsoft Keyboard Layout Creator. The Chuvash Computer Keyboard layouts have existed since 2001, but due to the lack for Unicode support we were forced to use the look-alike letters from other latin-based keyboard layouts. 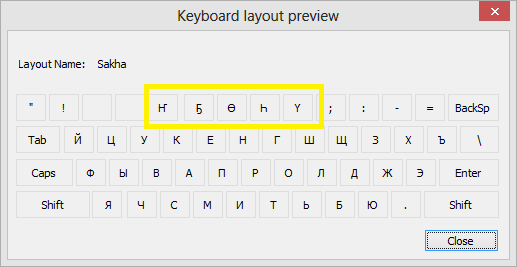 On Linux The Chuvash keyboard layout was added in 2007 and Linux is still the only operating system that has a native keyboard layout for Chuvash language. On Windows we have used the Keyboard Layout Creator and distributed it as an executable file. Today, when Windows XP is not supported anymore, the majority of users now have full support for the correct Chuvash letters from the Extended Cyrillic table. These four Chuvash letters are “additional” to the Russian alphabet: Ӑ, Ӗ, Ҫ and Ӳ. This switch will have a huge impact on the Chuvash language. Much of content on forums, websites and Chuvash Wikipedia will be hardly searchable. But we have to do it, to standardize and prepare for the future. The Chuvash language Committee is not against it, despite it has not been updated the guidelines for using letters from 2009. Today chuvash.org has switched to Cyrillic letters. I also submitted a pull request in momentjs to update the labels. I can’t write in Chuvash in Windows 8 (and all the previous Windows releases). Chuvash is a minority language in Russian Federation. In this blog post I want to summarize the status of the keyboard layout support of the minority languages of Russia and find a way to improve this situation. There are thousands of languages. Of course it is hard to support them all. As per 2012-02-21 Windows 8 supports 109 (!) languages. In december 2012 the support for Cheerokee language was added. This blog post is about the keyboard layouts, the easiest part of the “language” support in an operating system. There are 160 ethnic groups in Russia speaking over 100 minority languages. The most of ethnic groups ar so called stateless nations meaning there is no main country for this nation (e.g. Sami people in Sweden, but not Germans in the USA). In Russia there are 21 republics which have their own official languages alongside Russian and their purpose is to be home for ethnic groups. I’ll focus mostly on the official languages in these republics in this blog post, but it would be interesting to investigate smaller languages as well. The funny thing is that all the three are Turkic languages. These two languages (which are co-official languages in the republic of Mordovia) don’t use any additional letters. That’s it. So they can write using only the standard Russian keyboard layout. All these keyboard layouts were added by the community. I personally sent the Chuvash and Kalmyk fragments of that file to Sergey Udaltsov who created patch files and pushed it to freedesktop. 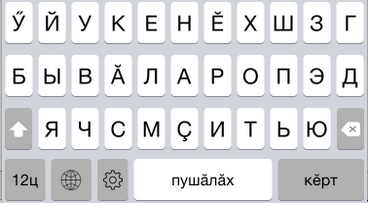 When I tried these three supported minority language keyboard layouts of Russia in touch mode, only one worked! It was the Tatar keyboard layout. The tatars can type all their additional letters in touch mode as well. And what about the virtual touch keyboard layout for Sakha language? As you can see there are no keys for the additional letters for Sakha language (ҕ ҥ ө һ). Many minority languages of Russian Federation (the most of them already endangered) miss the native keyboard layout support in Microsoft Windows 8 and Windows 7. Windows is a prevalent operating system in Russia. The support for minority language keyboard layout would help people to use their languages and give more chances for languages to survive. For now there are only 3 languages (besides Russian and implicitly some others like Moksha and Erzya) which are supported in Windows 8 with a physical keyboard: Tatar, Bashkir and Sakha. And only one of them (!) works even in touch mode: Tatar. The purpose of this post is only to identify the status for Russian Federation minority language keyboard layout support in Windows 8. Microsoft Local Language Program (LLP) seems very promising. 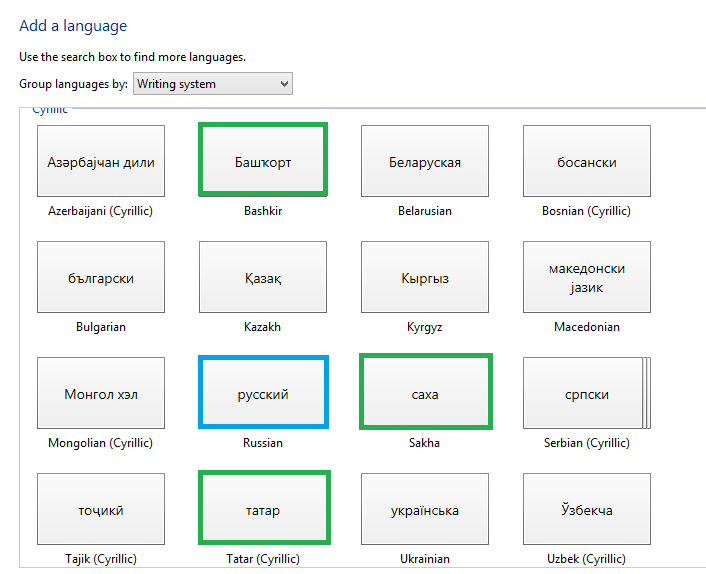 I hope we will see more languages of Russia and other countries available in “Add language” menu in Microsoft Windows 8. There is an interesting counter example in press-and-hold behavior. On a physical keyboard, when you press and hold a character, it repeats. On our touch keyboard when you press and hold, we show alternate characters or symbols. This is something a touch keyboard can do well and a physical keyboard can’t. If you don’t know the specific key combination to show ñ or é or š, for example, it’s painful to type on a physical keyboard. It’s easy to find on the touch keyboard. Practically no one has complained about this departure from convention. We built on it, in fact. You might discover that you can simply swipe from a key in the direction of the secondary key, and that character will be entered, without an explicit selection from the menu. So if you use accented characters a lot, you can get pretty fast with this. Bashkir and Sakha, I suppose, were considered whilst designing the keyboard layout, and Tuvan and Buryat language letters only happen to be within the Bashkir and Sakha letters range. Tatar letters aren’t complete in the standard Russian keyboard layout, the reason for that must be, as I mentioned above, the full functional virtual keyboard for Tatar (where is no need for long-tapping). There is another language which contains all the letters through long-tapping. Kazakh is absolutely a minority language of Russia, but it doesn’t represent a stateless nation. Now there is a Chuvash keyboard for Android. 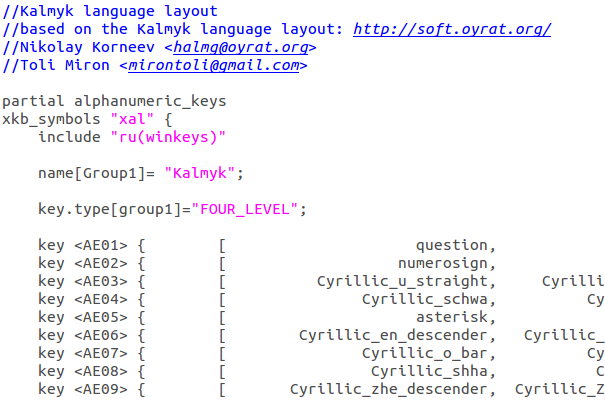 The little program uses AnySoftKeyboard application, gives the ability to write in Cyrillic and Latin. All kinds of feedback are appreciated. Chuvash Keyboard for Android is open source like AnySoftKeyboard.